Mrs Hemsley graduated from the Edinburgh School of Chiropody in 1985. Building on her experience in the NHS she developed a successful private practice in Edinburgh. During this time she developed an interest in sports podiatry which culminated in being part of the podiatric support for athletes at the Commonwealth Games and both the Glasgow and Edinburgh Marathons. 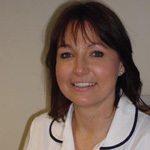 Since moving to Dorking Audrey has continued her private practice whilst raising her family. She is looking forward to developing the Advanced Footcare domiciliary service to local people bringing the highest standards of foot care in their home environment.